Vacations have changed a lot for me over the years. It used to be easy to define my vacations. I would book two or three weeks off work, pick a destination, travel there, see a bunch of things in the area, and then return home. I could easily articulate when vacation began, where I went, and when it ended. It came around once a year, often at the end of August — mainly because I wanted to know my own turn for vacation was coming while covering for coworkers who were taking time off earlier in the summer. Over the years, things changed. As my vacation entitlement at my job grew from three weeks, to four, and eventually five, it wasn’t practical nor desirable to take the whole thing at once. My single vacation began to get split up into a week or two here, a few days there, and maybe even an individual day in the middle of the week if something good came up. There no longer was a single “vacation” each year. My style also has changed. Vacation planning would start by sitting down with Microsoft Streets and Trips and plotting a route. It was my favorite route planning software because you could put in your starting point and end point, how fast your average driving speeds were expected to be, how often you would want a rest break, how long those breaks would last, and how many hours per day yo u wanted to drive, and the times of day you wanted to start and stop driving. Based on all those variables, it would show you whereabouts you could expect to end each day. I would use those suggestions to determine where the overnight stops would be and then look for appropriate accommodations near that area. You could also enter the capacity of your fuel tank, how much fuel you planned to start with, your expected mileage, and how low you were willing to get the tank get before filling up and it would show you where to get gas along the way. It was brilliant software and I haven’t found anything that can do everything as neatly and easily as it did. I believe the last version released was in 2012. That was my style. Build a plan and then execute on that plan. It was all about getting to the destination. The end goal was all that mattered. There was a schedule and it needed to be adhered to. It was that sort of mentality that allowed me to succeed in my various roles in I.T. and it was hard to escape. Now, the destination is somewhat irrelevant. There really isn’t even a defined destination. Last year’s trip to the southwestern U.S. is a great example — was Las Vegas the destination? It was the first and last stop, but it wasn’t really the “destination” per se. Was it the Grand Canyon? Generations of travelers have planned the quintessential family road trip with the Grand Canyon as the goal but it wasn’t really that way for us. Was it the portion of Route 66 we drove? Maybe, but can a stretch of highway be a destination unto itself? If not, it must be Bryce Canyon, right? Well, not really — we were there for less than half a day so how could it be the destination? Can getting there be half the fun when you don’t really know where there is? The original plan was to do the Oregon coast. I started off with my old trip planning mentality, except instead of Streets and Trips I was using a combination of Microsoft Excel and Google Maps. I plotted the route, picked the stops, outlined the schedule, and booked all the RV parks along the way. The Oregon coast is perhaps my favorite spot on Earth and I haven’t been back there since 2010. As I told Emily, I want to go back because having been away so long means I’m either going to “Go Coastal or Go Postal”. Our Moose Jaw trip showed how much gas our poor Ford F150 burns when pulling the trailer. Hmm, this could be quite expensive. 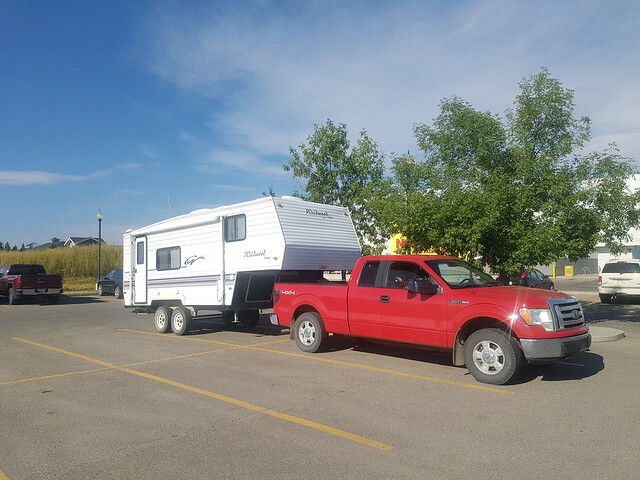 My last long RV trip was with my Cummins diesel which didn’t even notice there was a trailer behind us. This planted the first seed of doubt. The second seed of doubt came when we looked at the forest fire situation. I had planned for us to have a full day of exploring the Columbia River Gorge and the historical Columbia River Highway. Many of those locations were under threat of fire. And, the final nail in the coffin was that Emily really couldn’t afford to take two weeks away from work right now. Cutting the trip time in half made a run to the Oregon coast impractical, if not impossible. So, with those factors stacked against us, we gave up on Plan A and moved to Plan B. We decided to do a tour of Montana along Interstate 15. Lots of places we wanted to visit and a lot of history to check out. We opted to forego the trailer and instead motel it. We figured some of the places we wanted to see were on some rather tight backroads and having the trailer along could be a hinderance. “Plan B” was ready to roll. Well, after about five minutes of discussion, we decided to cancel Plan B. About five minutes later we ended up with Plan C — a run out to Vancouver Island. Two days out, a day on the island, and then three days home. With that basic framework in place, it wasn’t long before “Plan C” morphed into “Plan Sea” and we set off. What we discovered along the way was that there were many things to see. We managed to quickly visit some of them while many others were added to our virtual list of “We’ll come back one day.” Having discovered so many interesting places, we quickly changed the name of the trip from “Plan Sea” to “Scratching the Surface Tour 2017” because that’s all we were able to do on this trip. No time for diving deep, just scratch the surface, add it to the list, and move on. So many destinations and just one lifetime to see them all. So, that’s sort of an introduction into the next series of posts. I’ll show you some of the places we visited and maybe even mention some of the ones we didn’t get to see this time. I’m still on vacation for a few more days so I hope to get through most of the photos and video before work becomes a distraction again. Tell me about your trip planning. Do you like to see just a few places and really immerse yourself in them or do you like to see as much as possible even if it means not spending as much time at them? Do you fly by the seat of your pants and make up your itinerary as you go or do you have a plan that you stick to? This entry was posted in Travel and tagged Microsoft Streets and Trips, Oregon Coast, travel', trip planning, vacation, Vacation 2017. Bookmark the permalink. Can’t wait to hear about what you did, where you ate, and what you saw!